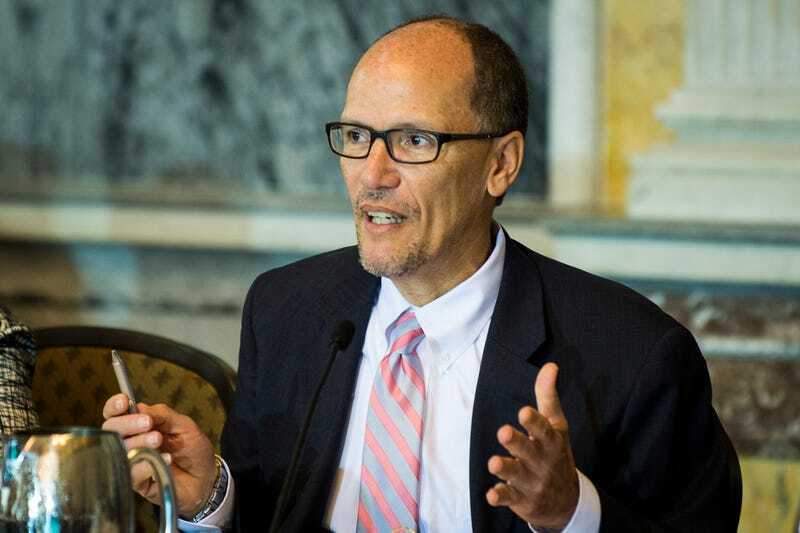 Tom Perez, former labor secretary in the Obama administration, has been elected the new Democratic National Committee chair, beating out Rep. Keith Ellison (D-Minn.) for the top spot, the Washington Post reports. In a move that jump-started the battle dubbed the “West Wing vs. the Left Wing,” veterans of the Obama administration urged Perez to jump into the race, which he did Dec. 15. In his first political act since leaving office, former Vice President Joe Biden also endorsed Perez. And because he was endorsed by Sen. Bernie Sanders (I-Vt.), Ellison also had to deal with lingering bitterness from the Hillary Clinton contingent within the party. Ellison, who is both black and Muslim, has faced both racism and Islamophobia throughout his career. Retired Harvard Law professor Alan Dershowitz, a lifelong Democrat, accused Ellison of anti-Semitism and said that he would quit the party, stop donating and encourage others to do the same if Ellison were elected chair. After it was announced that Perez won with 235 votes to Ellison’s 200 votes, “nine Ellison supporters chanted ‘power of the people, not big money,’ then stormed out of the room,” the Post reported. I congratulate Tom Perez on his election as chairman of the Democratic National Committee and look forward to working with him. It’s imperative Tom understands that the same-old, same-old isn’t working and that we must bring in working and young people in a new way. Ellison immediately urged unity after the contentious battle, saying that it is critical that the Democratic Party come together around shared values and commitment to moving the nation in a progressive direction. Absolutely what we have done in the negotiations with Mexico and with Vietnam are I think some of the most far-reaching protections that we’ve seen in a labor agreement. And that’s the work that I have done and I’m proud of that work we’ve done. My colleagues and I who voted against Trade Promotion Authority are not isolationists. We’re not against trade. We understand we live in a global economy. Many members of Congress have proposed models for fair trade deals that can’t even get a debate or a vote in the Congress. But the newest trade proposal before us, the Trans-Pacific Partnership (TPP), repeats the harmful practices of past deals. It contains specific threats to working people. I will continue to vote against Trade Promotion Authority until the Trans-Pacific Partnership is fixed. Perez also wants to focus on “rural Americans” in the Rust Belt—read: the white working class—who have allegedly been ignored by the Democratic Party. Because, as Hillary Clinton said while running against Barack Obama in 2008, Democrats need “working, hard-working Americans, white Americans” to win elections. Even with Perez’s arguably impressive record on civil rights—specifically championing fair and equal housing and working against white supremacist hate crimes and voter suppression—prioritizing Trump voters over the most disproportionately disenfranchised, marginalized and targeted in this country, those who feel the full brunt of institutional violence, is not unexpected. That strategy has been the Democratic Party’s line since Clinton’s loss, and it is highly unlikely that Perez, once on Clinton’s VP shortlist, will rattle that cage. Perez, the first Latino leader to be elected DNC chair, selected Ellison as his deputy chair. It will be interesting to watch where the party goes under his leadership.